Pray, where are the public-spirited politicians? WEDNESDAY’S gathering of Congressmen in Chandigarh on the occasion of Mr Shamsher Singh Dullo taking over as President of the Punjab Pradesh Congress Committee reflects the enthusiasm it has generated among partymen. Few nominations in the Congress have evoked the kind of response Mr Dullo’s has. AMIDST terrorist killings and encounter-killings, there are heart-warming reports emanating from the Kashmir Valley. Ultimately, the realisation has dawned on the separatist leadership that Kashmir without Kashmiri Pandits in unthinkable. DO phrases like willow cleft and pod shaving leave you stumped? If not, you would have greeted the news that Kashmir Chief Minister M.M. Sayeed was keen on promoting the state’s willow cricket bat industry, with a knowing smile. Prime Minister Manmohan Singh, by declaring that the world’s highest battlefield Siachen should be converted into a “mountain of peace”, has sent a clear signal to Pakistan that demilitarisation of Siachen is his political objective and he is committed to achieving it. My four-year-old son is convinced that his dad can do anything. You might not find it unusual because universally all four years olds feel the same for their dads. But look at this situation — even my son’s friends are convinced that I can do anything! It does not stop at that — some of their parents also feel the same about me! Disputes are inescapable facts of life. Many disputes end up in the cold and deep waters of litigation. They often cause people untold miseries, both emotionally and financially. The cost of litigation is almost as much as that of treating a major illness these days. Lala Vidya Sagar Oswal’s passing away has left a deep void in the industrial circles of the region. The doyen of the hosiery industry was known for his rock hard determination and hard work. Lalaji is also credited with making Ludhiana the industrial hub of the country. Defence Minister Pranab Mukherjee’s quick presence of mind helped defend himself against a violent mob that attacked him in the Congress office in Kolkata recently. A Congressman who was a witness to Pranabda’s gherao proudly recounted that the jab of the Defence Minister in a boxing stance did the trick. WEDNESDAY’S gathering of Congressmen in Chandigarh on the occasion of Mr Shamsher Singh Dullo taking over as President of the Punjab Pradesh Congress Committee reflects the enthusiasm it has generated among partymen. Few nominations in the Congress have evoked the kind of response Mr Dullo’s has. Enthused as he was by the huge turnout, Mr Dullo bemoaned the predicament of the Congressmen. He even reminisced about the days when “officers used to get up from their chairs on seeing a Congress worker in khadi entering their offices”. Chief Minister Amarinder Singh, who was present on the occasion, was so touched that he announced his plan to hold a meeting of all deputy commissioners and district police chiefs to tell them to attend to Congress leaders who go to them for community work. In a democracy, officials cannot remain aloof from political leaders, who have every right to approach the former for public work. But is that the purpose for which most politicians go to government offices? Cases of those knocking on the doors of officials for their personal work are legion. More worrisome is the pressure they exert to prevent them from discharging their duties. As for community work, there are elected representatives whose job it is to get such work done. It is a different matter that most of them like ministers have become inaccessible to the common man. In no case can officials make a distinction between Congress workers and other party workers. Seen against this backdrop, the Chief Minister’s planned meeting is ill-advised. On the contrary, there is a strong case to keep the bureaucracy free from political interference. If the Congress is in power today, it can be the Akali Dal tomorrow. How can officials take sides? As regards Mr Dullo’s lamentation, khadi at one time represented all that was noble in politics. Can the same be said now about the dress that the Mahatma popularised as part of the freedom struggle? In fact, finding an honest politician is as difficult as finding a needle in a haystack. If there are any, they will always command respect, whether they are in the Congress or in any other party. No goading from the Chief Minister or the PPCC chief will work. After all, respect can only be earned, not demanded. AMIDST terrorist killings and encounter-killings, there are heart-warming reports emanating from the Kashmir Valley. Ultimately, the realisation has dawned on the separatist leadership that Kashmir without Kashmiri Pandits in unthinkable. The result is a declaration after a landmark meeting between the Mirwaiz Umar Farooq-led Hurriyat Conference and the various organisations representing the Pandits (minus the Kashmir Samiti and the Panun Kashmir) that “Pandits will return to the Valley with a deeper sense of security and dignity.” This is, without doubt, a major development likely to help the efforts for restoring normalcy in the militancy-hit state. The Kashmiri Pandits had become aliens in their own country as a result of the terrorist campaigns, aided and abetted from across the LoC. Their return back home will mean a defeat for the forces working overtime to bring about a dangerous change in the demographic complexion of the Valley. Their efforts were aimed at depriving the state, known for its secular values, of the talent it needed for its overall progress. Kashmiriyat will rein supreme again once the Pandits, the core of the Valley’s society, are able to live in the midst of their brothers and sisters who have everything in common with them except for their faith. However, those working to translate the Pandit dream into a reality must keep one thing in mind: they must abandon the enclave idea. Any effort to create an enclave of the Pandits can be counter-productive. It will not only endanger their lives and property but also defeat the purpose of giving a new life to the cause of Kashmiriyat, so essential for lasting peace in the Valley. The state government and the Centre should create an environment so that the Pandits are able to live fearlessly anywhere they wish to. Stray incidents of terrorist violence cannot dampen their spirits if there is a welcoming atmosphere. The Pandits’ presence can speed up the process of growth, which may lead to terrorism dying its natural death. The opportunity provided by the rapprochement between the Pandits and the Hurriyat should not go waste. DO phrases like willow cleft and pod shaving leave you stumped? If not, you would have greeted the news that Kashmir Chief Minister M.M. Sayeed was keen on promoting the state’s willow cricket bat industry, with a knowing smile. You would be joined in your pleasure by those who only know about square cuts and cover drives, but can nevertheless tell a good bat from a bad one by merely running their eyes over the grain, and by taking a heave or two to check its weight and balance. The Kashmir bat industry provides employment to some 5,00,000 people, and Kashmir willow is said to be of very good quality. Promoted assiduously, it can well rival the famed English willow. Mr Sayeed recently laid the foundation stone for a Rs 5.72 crore `common marketing facility’ for the industry, and is talking about a future cricket bat cluster on 300 kanals of land, exhibitions, and guest houses for potential buyers. To encourage local manufacturing, willow cleft exports from the state has been stopped. A willow cleft is a rough bat shaped from willow, which is then sold to bat makers. The industry, however, should be careful about plans for ``seasoning plants’. As a classic English pod shaver (bat maker) will tell you, the best bats come from naturally dried clefts, and not those `seasoned’ in a plant. Mr Sayeed has talked about protecting the `brand name’ of Kashmir willow. He had in mind the fate of the `Kashmiri shawl’, corrupted to the detriment of both consumer and genuine manufacturer. In fact, a `geographical indication’ is one of the seven types of intellectual property rights detailed under the TRIPS agreement, and India passed a Geographical Indications of Goods Bill in December 1999. The right recognises that a product’s association with genuineness and quality can come from a specific geographical area – like Champagne or Bikaner. There is nothing quite like hitting the `sweet spot’ of a good bat, and watching the red cherry race away to the boundary line. I served in the Siachen in the nineties while being associated with the Cabinet Secretariat. Even during those days, efforts on the part of India had been to demilitarise the glacier. However, the attitude of Pakistan had always been hostile and negative. Both India and Pakistan are maintaining over 4000 troops each at the Siachen, supported by other arms and services. The maintenance expenditure for these troops is around Rs 250 crore per annum for each country, which both countries can ill-afford. The Pakistani Army is slightly better off since it occupies a smaller portion of the glacier, and its road-head is only 20 km away from the farthest post. Indian troops, on the other hand, are stationed about 80 km away from the road-head and have to be maintained entirely by air, which is not only cost-prohibitive but also risky because of the adverse weather conditions most of the times. The truth is that both countries are losing more than 1000 soldiers every year due to high altitude diseases and injuries. Both are evacuating a large number of soldiers from the highest battlefield of the world without fighting a pitched battle. The troops there suffer from high altitude diseases like frostbite, and pulmonary oedema (HAPO). Most of the injured either are put in the low medical categories or are discharged with disability pension. Why should both countries not disengage their troops and declare it as a demilitarised zone as it was during the early 1980s? This can easily be done during the future talks. Following the war of December, 1971, Lt. Gen. P.S. Bhagat of the Indian Army and Lt.-Gen. Abdul Hamid Khan of the Pakistan Army signed an agreement at Suchetgarh on December 11, 1972, and exchanged maps delineating the Line of Control (LoC) from the Chhamb sector to the Partapur sector in Ladakh. The northern-most portion of the CFL was along Neril (inclusive to India), Brielman (inclusive to Pakistan) and the north of Chet in the Kargil sector up to Chorbatla in the Turtok sector. From there, the LoC runs northeastwards to Thang (inclusive to India), then eastwards joining the glacier. The detailed description in the mosaic maps ended the LoC at the grid point NJ 9842. This was well below the glaciers, which was trusted to keep the two countries apart in this area. Neither side had any presence there until 1980. It was only in early 1980 that foreign expeditions from PoK to the region aroused India’s concern. India’s pre-emptive Operation Meghdoot in 1984 placed a platoon each at the Sia La and Bilafond La passes. India acquired its presence as far-west as Indira Col, which controls those passes. Pakistan acquired permanent passes at Gyong La and some other points nearby. A Siachen dispute then erupted. The battle zone comprised an inverted triangle resting on NJ 9842 with Indira Col and the Karakoram Pass as the other two extremes. Rajiv Gandhi and Gen Zia-ul-Haq agreed at their summit in New Delhi in December 17, 1985, to hold talks on the issue at the level of defence secretaries. Four rounds of talks followed: January 10-12, 1986; June 11-13, 1986; May 18-20, 1988; and September 22-24, 1988. The ground was thus prepared for a breakthrough at the fifth round in Islamabad on June 15-17, 1989, recorded the agreement. “There was an agreement by both sides to work towards a comprehensive settlement, based on redeployment of forces to reduce the chances of conflict, avoidance of the use of force and the determination of future positions on the ground so as to conform to the Shimla Agreement and to ensure durable peace in the Siachen area. The Army authorities of both sides will determine these positions.” However, the talks between the military representatives (July 11-13 and August 17-18) in 1989 remained inconclusive. The sixth round was held in New Delhi in 1992. Both sides made proposals which were non-starters. India proposed the demarcation of the LoC in the area; redeployment of troops of both sides to agreed positions; definition of the agreed zone of disengagement which would thus be formed keeping in view the Actual Ground Position Line (AGPL). Pakistan proposed a mutual withdrawal of troops from the Karakoram Pass to Indira Col right down to NJ 9842. It made a second proposal for the redeployment of troops, which was not acceptable to India resulting in the breakdown of the talks. In view of the rise in militancy in Jammu and Kashmir, India’s non-paper to Pakistan in January 1994 gave a proposal for the withdrawal of troops from the Siachen, saying that “during the discussions between India and Pakistan at the sixth round of talks at New Delhi, 1992, on the Siachen, a broad understanding had been reached on disengagement, monitoring, maintenance of peace and implementation of schedule…” Pakistan, however, insisted that the whole of the Kashmir issue should be settled on the basis of a plebiscite and hence the talks failed. When the India-Pakistan secretary-level talks took place in Islamabad recently, the demilitarisation of the Siachen glacier was one of the issues on the agenda. However, there was no breakthrough on the issue. The reason was Army Chief Gen J.J. Singh’s categorical statement that any agreement would have to proceed from the recognition of the AGPL. Defence Secretary-level negotiating teams will never produce any result that will satisfy the two parties. The real challenge is to ensure that the glacier remains demilitarised once India and Pakistan withdraw. This guarantee must necessarily be political rather than military. This can only be achieved if both Dr Manmohan Singh and Gen Pervez Musharraf have direct talks, keeping the Kashmir question aside. A discussion organised by the Observer Research Foundation on May 4 unanimously recommended that unless Pakistan recognised the existing positions, India should not agree to demilitarisation. If Dr Singh has to achieve his dream of making the Siachen a “mountain of peace”, he has to ensure that the glacier problem is discussed at the summit level in isolation of the Kashmir problem in the interest of both countries. He has also to ensure authentication, which is not a big problem. The purpose of authentication is to ensure that after withdrawal, Pakistan does not move back to its old positions or up Gyong La, Bilafond La and Sia La — the three passes along the Saltro ridge. Finally, both countries have to trust each other and respect the AGPL. Well, before you rubbish me as yet another bombastic loudmouth, please consider this — I belong to a species of homo-sapiens, that wear a khaki uniform. Yes my friends, I am a cop in India and I have been one for 12 years now. And all these years spent in the police I have come across a lot of my countrymen who hold cops in great awe because they perceive us as omnipotent. Let me tell you about a friend’s experience. She was posted as a district Superintendent of Police and the panchayat elections were due. Now for those of you who are the City Types, I must add that panchayat elections are the most keenly contested elections in India — Yes much more than the state or national ones. And a day before the polls all liquor vends and bars in the area are closed, by order. In spite of every effort people commonly flout these orders since every candidate feels it is necessary to keep the voter in high spirits! I am a poor man aspiring to be the Pradhan of my Panchayat. As your goodself is aware this is a matter of great prestige. You also know that politics is only for the rich and mighty. Yet I have decided to stake my honour. Sirji! I am a poor man and lack the power and money that the others in the fray possers. I have heard that your goodself is a kind hearted officer. People of the district see you as an avtaar of Durga in Khaki. This gives courage to a poor man like me to contest against many powerful people. With a lot of hope I have come to your high office with a simple request that I want to make with folded hands. It is very kindly requested that I may be allowed to distribute liquor to my voters for the next four days so that fairplay is maintained in the contest! And also permission to serve liquor only in my premises! Knowing my friend I am certain she did not permit the applicant to serve his electorate well. I can imagine that the poor fellow lost the election. He must be convinced that the Superintendent of Police in spite of her power and fantastic reputation chose not to help a poor man like him. Yet, I am also certain he still feels that the police is and will remain the most powerful variety of human beings in India! Litigants are thus weary of lengthy, tedious and expensive legal procedure and courtroom battles. As a result, there is need to improve the administration of justice by using some innovative techniques of dispute resolution. At a seminar on judicial reforms by the Bar Council of India, concluded some time back, President Abdul Kalam called upon judges to put in two extra hours everyday to reduce the staggering backlog of pending cases in our courts. The suggestion, however, did not find favour with the majority opinion of the legal fraternity, as the judges, according to them, are already over-worked. The need for appointment of more judges is, therefore, generally emphasised in the interest of early and quality justice. As a partial solution to the problem, apart from filling all vacancies and increasing the number of judges, there is need to popularise and strengthen the concept of “Alternative Dispute Resolution,” more frequently called ADR, which provides way of fairly resolving disputes and is also not so expensive and time consuming. The term “alternative” is in the sense of amicable settlement, alternative to the traditional, confrontatial, adjucative and adversial methods of civil litigation. ADR has accordingly been recognised and endorsed as an effective means of tackling the vexed issues of delay and cost. Section 89 of the Code of Civil Procedure (Amendment) Act, 1999, relates to the settlement of disputes outside the court and is a significant step towards amicable dispute resolution. The Act prescribes to refer the disputes by the court after framing the issues for settlement by way of arbitration, conciliation, mediation or judicial settlement through Lok Adalat. It is only if the parties have failed to get their disputes settled through these ADR methods that the suit shall be processed further in the court. Such court-annexed ADR system is thus meant to supplement the established legal system for dispensation of speedy and cost effective justice. Lok Adalats have played a significant role during the last two decades or so in the amicable settlement of legal disputes. Lok Adalat is not a new concept. It may be termed as a fusion of ancient and modern systems. For a long time in our history, disputes were settled by elders in panchayats. The famous justice-inspiring story “Panch Prameshwar” by Prem Chand, a renowned Hindi writer, is worth reading. More than a century ago Abraham Lincon wrote, “Discourage litigation. Persuade your neighbours to compromise whenever you can. Point out to them how the nominal winner is often a real loser in fees, expenses and waste of time”. The term ADR refers voluntary methods of resolving law suits that do not depend upon traditional judicial procedures. Most of ADR methods share some common characteristics. Important among these are early settlement, significant reduction in cost, simple, convenient and understandable process. The ADR approach offers flexibility and is more informal. The process tends to preserve the working relationship between the parties, being a less confrontational mode of dispute resolution. The advantages thus include informality, speed and economy, but most importantly, it leads to an agreed settlement without any further scope of appeal, review or revision. It will allow judges to devote more time to other law suits that require court determination and thus reduce court congestion. ADR thus offers a framework of amicable settlement of disputes with the assistance of impartial and independent individuals known as “neutrals”. The success will depend upon the quality of neutrals. A suggestion worth considering is the creation of special mediation and conciliation centres on the lines of Maharashtra in all other states and also creation of a panel of retired judges to act as neutrals along with experts, senior lawyers and even senior citizens. Going by the volume of litigation in the country, it may be desirable to train people who can act as neutrals. Success will also depend upon the much-needed change in the mindset of people who need to be educated as perhaps they are guided that ADR is a second rate justice and that they are foregoing their legal rights. The legal profession probably is educated in the traditional practice of “how to win”. But the words of the President of Colombia University in this regard are significant. “The idea that we spend all our time in law school teaching people how to win instead of how to settle is damaging”. The writer is a former Engineer-in-Chief, Himachal Pradesh, based in Mandi. Mr S.P. Oswal of the Vardhman Group describes his uncle as a real “karmyogi” who had slogged all his life to make the Oswal group reach where it is today. He said they had lost their guiding force. Two failed ventures, a job in a hosiery unit at a monthly salary of Rs 10 and then, a small hosiery unit set up with an investment of Rs 100. This is how began the man who built a multi-crore empire when he shifted from his native village Jodhan to Ludhiana. But all for that unmatched acumen and determination, Vidya Sagar never called it quits and not only built the Oswal group, he also made Ludhiana an industrial hub. Born on September 7, 1908, Vidya Sagar, the eldest son of the family, set up an ahrtiya shop and then a provisional store when he shifted to Ludhiana. However, both ventures failed after which he took up a job on a monthly salary of Rs 10 with a leading hosiery manufacturer of his time. The entrepreneur in Vidya Sagar picked up nuances of the trade and he started manufacturing socks. The first milestone in his journey was the incorporation of a public limited company in 1949, Oswal Woollen Mills. There was no looking back after that. Business expanded fast and under his leadership, the group diversified into manufacturing knitwears, cotton, yarn, vegetable oils, vanaspati, sugar, chemicals, paper, steel and fertilisers. His brothers — Lachhman Das and Amarnath Oswal — passed away and after seven years of working with him, younger brother Ratan Chand Oswal too died. But Lalaji did not let the personal loss deviate him from his struggle. In business, he is known to have followed practices modern management gurus preach today. He was a philanthropist too. The charitable hospital, Mohan Dai Oswal Cancer Hospital, that he set up in memory of his wife, was an effort towards contributing his bit to society. Defence Minister Pranab Mukherjee’s quick presence of mind helped defend himself against a violent mob that attacked him in the Congress office in Kolkata recently. A Congressman who was a witness to Pranabda’s gherao proudly recounted that the jab of the Defence Minister in a boxing stance did the trick. It was sheer self-defence on sensing danger when the mob menacingly moved towards him. 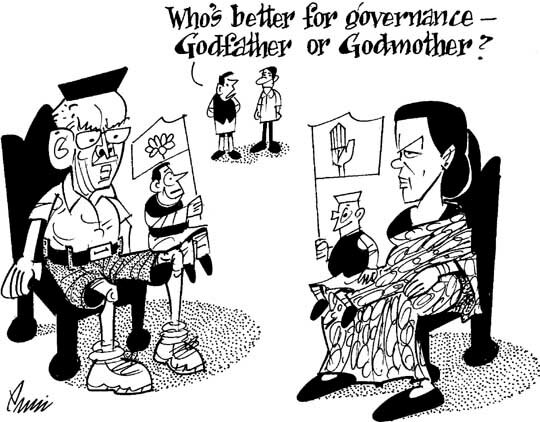 Pranabda was convinced that these elements were not Congressmen but street urchins bent on creating trouble. He also asked the Congress cadre present not to get into the act as that would have led to a pitched battle. Probably, Pranabda’s training as a soccer player came in handy. The strategist in him was quick to realise that his lack of height could be used to his advantage. Prime Minister Manmohan Singh has directed that his MOS in the PMO Prithviraj Chauhan should attend meetings of the Cabinet Committee on Security when topics like space and atomic energy are on the agenda. The amiable and hard-working Chauhan is a member of the Atomic Energy Commission and the Space Commission. Chauhan is currently in charge of Sports and Youth Affairs, which was the portfolio of the late Sunil Dutt. The Indian cricket team due to tour Sri Lanka has many firsts. For the first time in many years, no player from Mumbai is part of the team. In addition, for the first time two players from the country’s largest state Uttar Pradesh — Mohd Kaif and Suresh Raina — will be representing India in the same team. Also, perhaps for the first time, all the three coaches participating in the tri-nation series in the Emerald Island are from Down Under — Greg Chappel (India), Tom Moody (Sri Lanka) and Bennet King (West Indies). Incidentally, Moody and Chappel appeared for the interview for the coveted post of the Indian cricket coach in the national Capital. Greg stayed back and Moody took the first flight to Colombo. The controversy about the ownership of Taj Mahal, sparked by an absurd claim made by the Uttar Pradesh Sunni Central Waqf Board, is meant to grab the handsome gate money the monument generates. The credentials of the board are suspicious as almost all the 126,000 properties under its control in Uttar Pradesh are pining for want of attention. The Board members have frittered away an equal number of properties. Even countrywide, the Waqf management has been mired in corruption. The Taj represents the secular fabric of India and belongs to all citizens. Putting it under a religious platform would mean applying a communal paintbrush. It was not even wholly an unknown region that intrepaid explorers sought to discover. No one knew what there may be in the vicinity of the North-Pole but everyone knows its geographical position. A man who does not speak may not be wise. A man who chatters incessantly may not be wise. Wisdom lies in knowing when to speak and when to be silent. Skill cannot be developed by mere wishing. The warrior has to practice constantly. He must think about his goal all the time. He must concentrate to the exclusion of all else. If God helps you, then no one can overcome you; and if God forsakes you, who could help you then? So let believers put their trust in God. Have you seen how a fish taken out of water and flung to the ground writhes in agony? When you see the thoughtless man suffering the results of his deeds, are you reminded of the fish? Call the great Omnipresent with all your heart, from the depths of your soul, with all your joys or all your anguish. You will be protected as mother guards her child. Seven factors of Enlightenment: Mindfulness; Investigation; Energy; Rapture; Tranquillity; Concentration; and Equanimity.